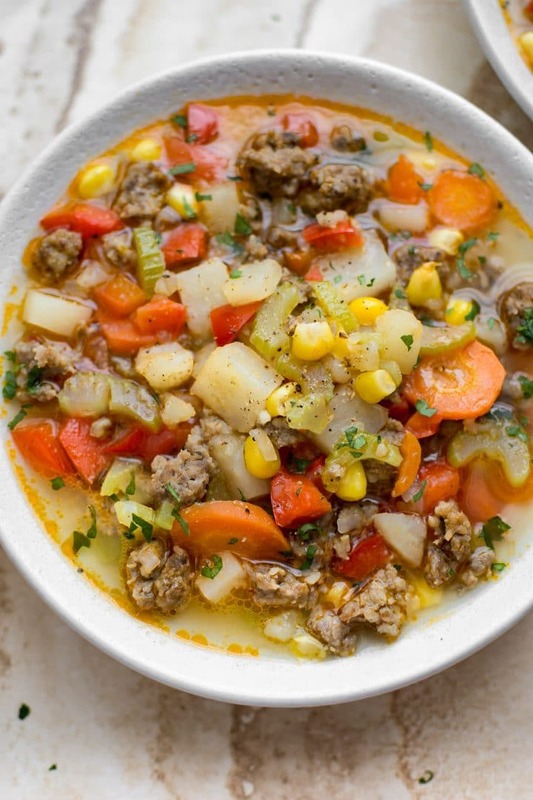 This sausage and vegetable soup recipe is hearty and delicious. Italian sausage, potatoes, and a flavorful broth make a tasty and filling meal. I’ve made this soup twice so far, and it makes excellent leftovers. It’s one of those soups that tastes even better a day or two later. It’s one of my favorite lunches to take to work these days. 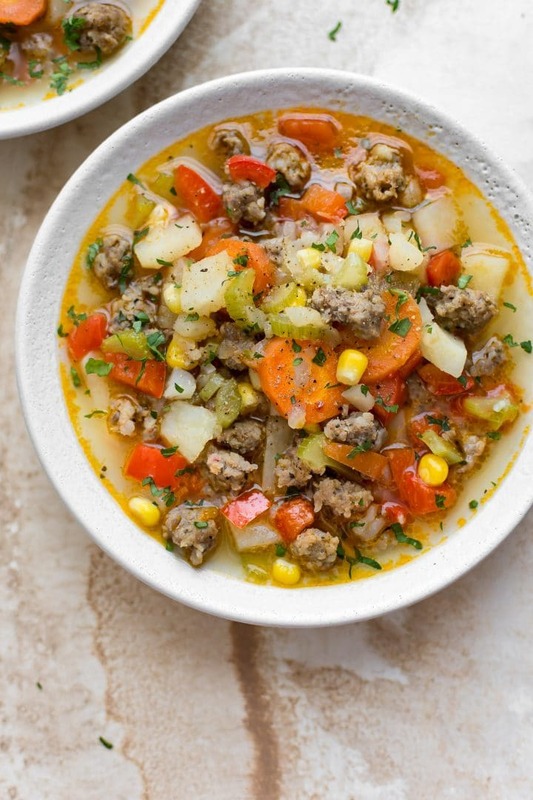 This Italian sausage and vegetable soup is very easy to make and actually fairly healthy due to all the veggies. The hardest part is chopping everything up, but I like to chop as I go along to save some time. Can I substitute Italian sausage for another kind? Absolutely! You could even use chicken sausage. I used a 5-pack of Johnsonville’s mild Italian sausages. Feel free to use hot or whatever kind you like best. Pro tip: I spoon out some of the fat (about half) after I cook the sausage meat, but I do like to leave some in – it helps cooks the onions and celery and also adds more flavor to the soup. If your sausage isn’t very fatty, don’t bother draining it at all. Like this recipe? You may also like my Crockpot Italian sausage soup or my Italian sausage tortellini soup. Can I add other vegetables to this soup? Yes! This is one of those soups where you could definitely clean out the fridge. Feel free to substitute any veggies you don’t like in this soup. I loved adding the red peppers because sausage and peppers go so well together! 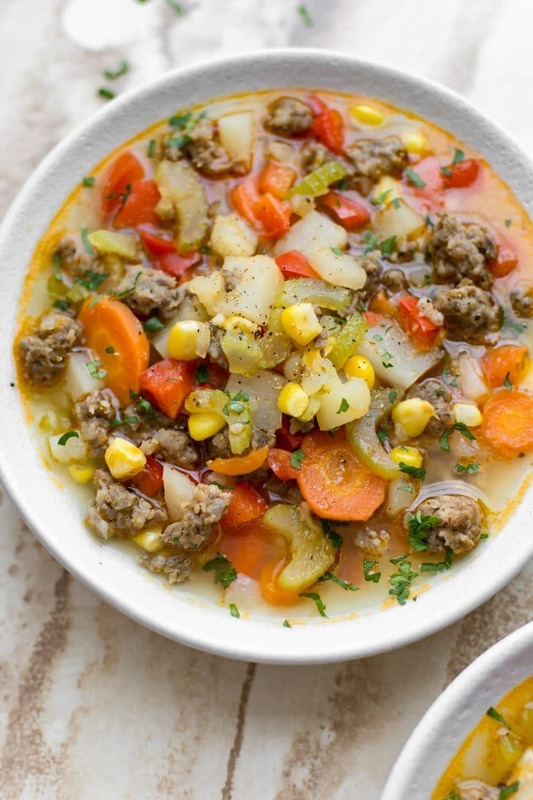 Will you give this sausage and vegetable soup a try? Take the sausage meat out of the casings and crumble it into a large soup pot over medium-high heat. Cook for 5 minutes, stirring occasionally. Drain a bit of the fat, leaving some in for flavor. I prep as I go along, so I chop the onion and get the other ingredients started as the sausage cooks. Add the onion, celery, and garlic to the pot. Continue cooking it for another 5 minutes. Meanwhile, chop any remaining ingredients. Add in the chicken broth, water, carrots, potatoes, red pepper, and corn. Increase the heat to high and bring the soup to a boil. Once it's boiling, reduce the heat and let it simmer for 15-20 minutes or until the potatoes and carrots are tender. Season with salt & pepper as needed. 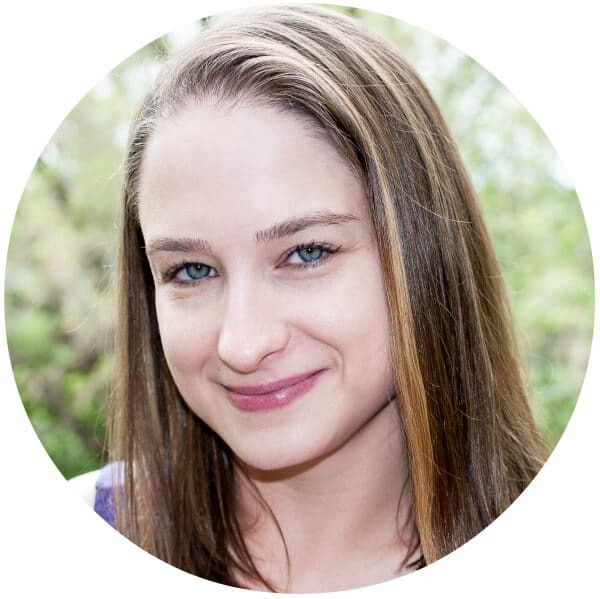 I prep as I go along, so if you don't do that, prep time will take a bit longer. I used a 5-pack of Johnsonville mild Italian sausages. You can use ground sausage meat if you prefer. 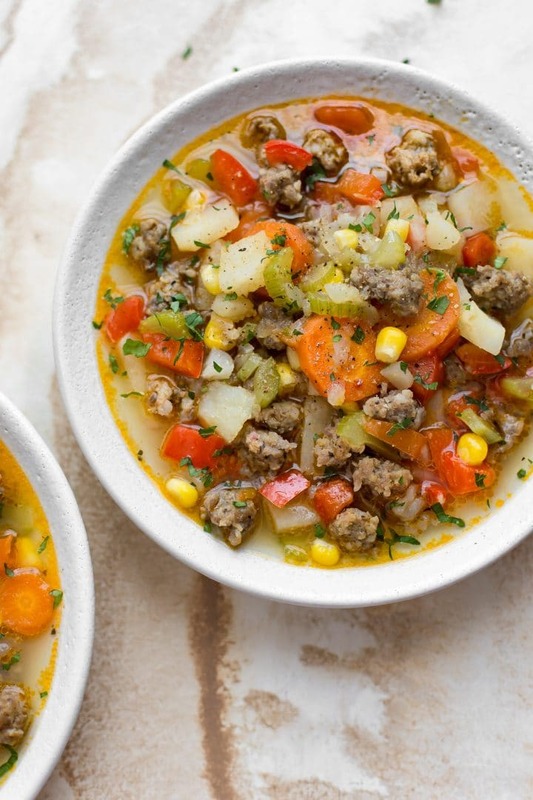 I love the idea of Italian sausage in soup! Loading it up with veggies and adding chicken broth is simple and genius! Are you going to make this for me without sausage? Thx. I’m excited to try this for dinner tomorrow. It sounds delicious! Hope you like it, Karen! This soup looks so incredible right now! LOVE!!!! This soup looks amazing! LOVE! 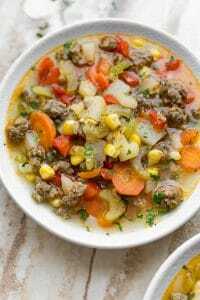 I love the idea of a sausage and vegetable soup! My whole family would gobble this one up! Love this soup! I used sweet potato instead of regular and I also used mild and hot sausages and it turned out great!